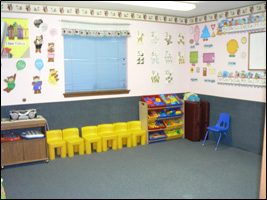 As you can see from our class schedule, your toddler will stay very busy each day. Our learning experiences will be hands-on and give the children free choices to explore by touching, seeing, hearing and doing. We will include: creative art activities, different types of music, story times, activities to improve small and gross motor skills, and lots of talking and singing to improve language skills. We will also be working on life skills such as eating with utensils, drinking from a cup, napping on a mat and sitting still for story time. For health reasons, we do not allow children to have a bottle or pacifier. Some children will begin to show an interest in potty training around 18 -30 months of age. We will work with you on this when your child is ready. Please consult the teachers before you begin to work with your child so that we can be consistent at home and school. Diapers – send a package, we will let you know when you are running low. A “P.S.” regarding clothing – please dress your child in comfortable clothing that is suitable for playing and quick and easy to deal with at diaper changing time. Rubber sole tennis shoes are ideal for play time and the play ground.